Dr. Tim Thompson speaks with a patient in the Intensive Care Unit at Baptist Memorial Hospital - Union County. In the right background is Vicki Byars, manager of the Baptist - Union County ICU, who is talking with eICU nurse, LaTonya Davis, at the Baptist Telehealth Center in Memphis, shown on the monitor. Baptist Memorial Hospital-Union County is part of a growing trend that is changing the basic idea of care delivery through the addition of telehealth services. A new field of medicine, telehealth offers innovative, life-saving practices for intensive care unit patients, stroke patients and patients fighting infectious disease. Each individual technology under the telehealth medicine umbrella brings targeted treatment to these patients. In all cases, telehealth breaks down traditional barriers to care like geography, time, and lack of specialists in rural or remote areas. 24/7 remote patient monitoring by experienced critical care nurses who can answer questions or discuss patient care. Education and mentoring for newer ICU nurses. Changes in patients’ conditions are quickly identified in real time and addressed immediately to help avoid complications during recovery. Shorter lengths of stay in the unit for some patients. Fewer days on a ventilator. Lower rate of preventable complications, such as pneumonia and sepsis. Vicki Byars, manager of the Baptist – Union County ICU is shown working at one of the hospital’s new Telehealth work stations. 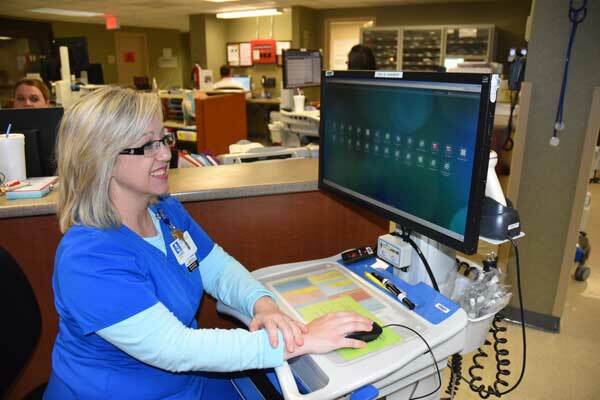 Through a camera and monitor mounted on the wall in each of the hospital’s eight ICU rooms, nurses in Memphis can view a New Albany patient in real time, said Vickie Byars, manager of the hospital’s intensive care unit. Provides a fast and accurate diagnosis for neurology patients. Neurologist consult available 24/7 to provide guidance to the emergency room staff on how best to treat the patient, including whether or not the patient needs to be admitted or transferred to another hospital. The neurologist can also guide the team on the administration of tPA, a clot-busting treatment administered through IV that is considered best practice in treating stroke patients. Typically, treatment is completed within an hour. When intervention happens early, patients generally experience better long-term recovery. White also noted that the hospital offers infectious disease and neonatology consults via telemedicine. Baptist Memorial Hospital-Union County, the recipient of many awards and accolades, was awarded the Outstanding Patient Experience Award by Healthgrades and was named a Top Performer on Key Quality Measures® by The Joint Commission, the leading accreditor of health care organizations in America, in 2012 and 2013. Baptist Union County offers a variety of health care services, including adult and pediatric inpatient services, labor and delivery, outpatient and laser surgery and a 24-hour, newly renovated emergency room. The hospital also offers telemedicine and imaging and laboratory services, including an American College of Radiology-accredited MRI machine.